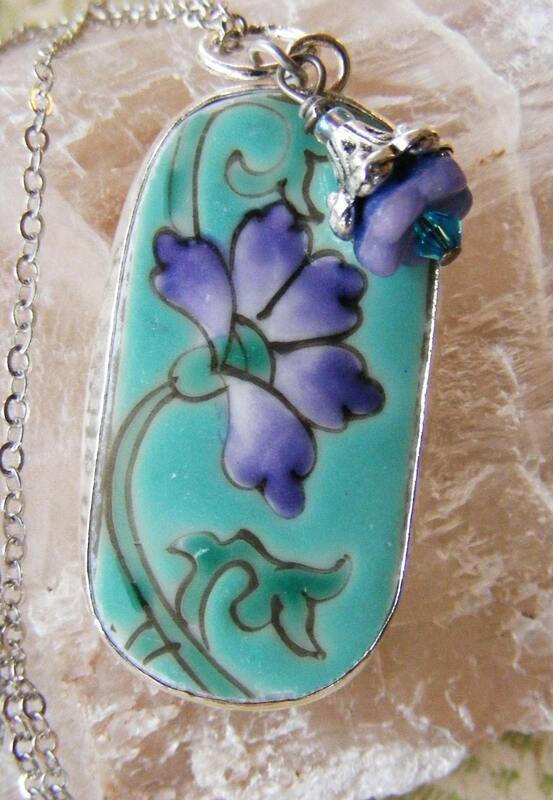 This pendant is made from an ancient pottery shard discovered at an archeological dig of a Chinese porcelain factory. It is set in antique silver. The colors in this pendant are so rich and beautiful. I love the sweet sky blue with the smoky purple of the flower and the sage of the leaf and stem. The pendant is 1 3/4 inch long and 7/8 inch wide (42mm x 23mm) and has a charming little bead charm of glass, crystal and silver ox. The lovely delicate silver ox chain is 20 inches long with a lobster claw clasp. Folksy :: Buy "Hearts and Flowers Pendant and chain"